Laura Powell left WKRQ-FM in late April. Powell, who vanished from the WKRQ-FM airwaves in late April, won't talk about why she no longer co-hosts 3-7 p.m. with "Jon." Neither will Patti Marshall, Q102 program director. "I would like to say thank you to the listeners that enjoyed our afternoon show. You are family! Thanks for all the stories and the belly laughs. Laura Powell with former co-host Brian Douglas in 2015. "I don't know if I will continue to be on the radio. There may be another calling for me. On to the next adventure!" As for why she left the station, Powell says: "It is true that I no longer work for Q102 FM. First, I would like to say that their parent company, Hubbard Radio, is a wonderful company. They care about the well being of their employees. I am unable to get into the details of my departure due to contractual restrictions. But, I can say I respect the station for being there whenever I needed. "Q102 has always been innovative and successful. And as they move into their next direction, unfortunately I was not in the mix." Marshall simply tells me: "Laura is no longer with the station. Unfortunately, we can’t discuss personnel matters. Jon remains on the air in afternoons." So this is the best I can do for all who asked me "What happened to Laura Powell?" Before Jon, Powell was paired with long-time Q102's Brian Douglas. When Douglas left in October 2015 after 28 years to pursue a movie set photography career, he and Powell had been No. 1 with woman ages 25-54 for four years. Douglas shot production photos for John Travolta's "Gotti," Don Cheadle's "Miles Ahead" and Zach Efron's Ted Bundy movie, "Extremely Wicked, Shockingly Evil, and Vile." Brian Douglas, WKRQ-FM’s MVP – most versatile personality – leaves Q102 Friday to take a shot at becoming a full-time photographer. “The past 28 years have been the absolute best years of my life. 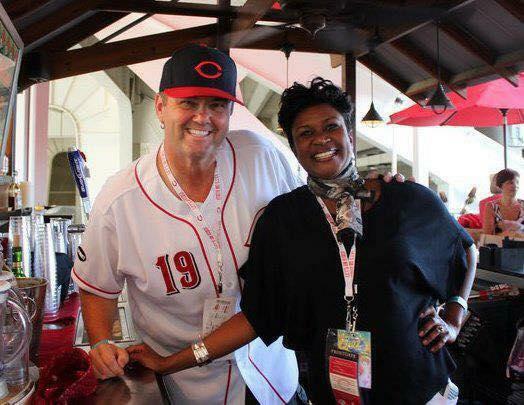 I have been blessed beyond belief to work at Q102 in my hometown of Cincinnati,” said Douglas, who will do some part-time fill-in shifts at Q102, as his schedule permits.